I am popping in with a quick post with this die. This die is finally back in stock over Simon Says Stamp. I chose the easiest way to use this"Flowing Vine Collage". This die is versatile that you can use any orientation that you like. Whether it's vertical or horizontal, they all work fabulously! 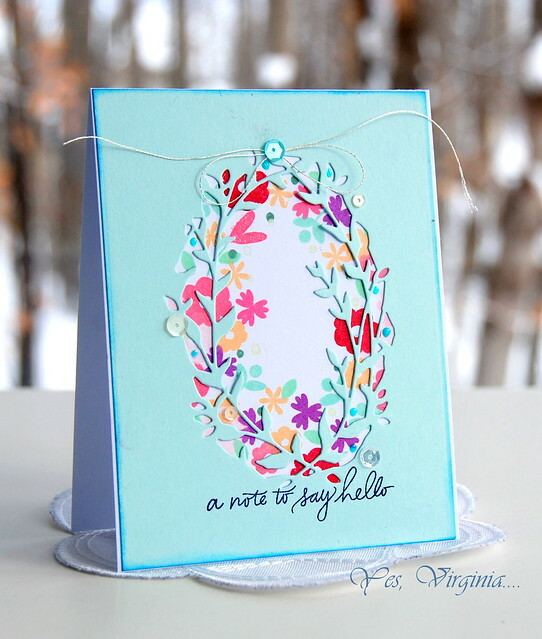 Basically, I added all the embellish touches on the vines with Nuvo Drops and Wink of Stella. I used one of my DIY Watercolor paper (see links below for the Distress Sprays) for the base of the sentiment. You can use any paper that you have on hand. Design paper or pattern paper will work beautifully as well. if you are shopping over Simon Says Stamp. The NEW Altenew goodness here. 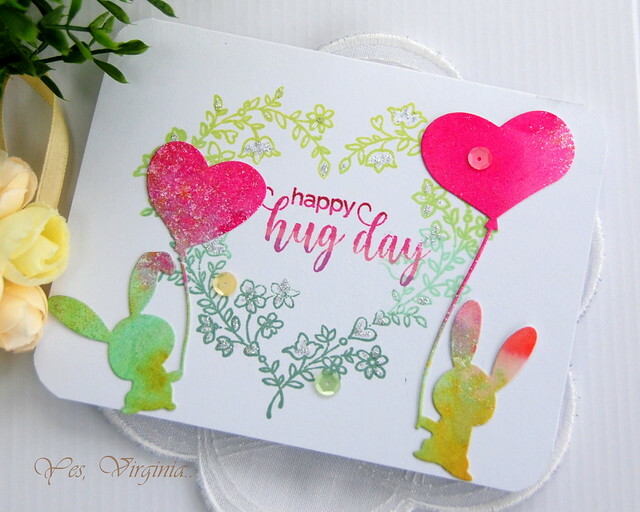 For the bunny, I simply made a piece of DIY watercolor paper and die cut from it. I have listed all the supplies (see inLinkz) that I used for creating my own color paper. 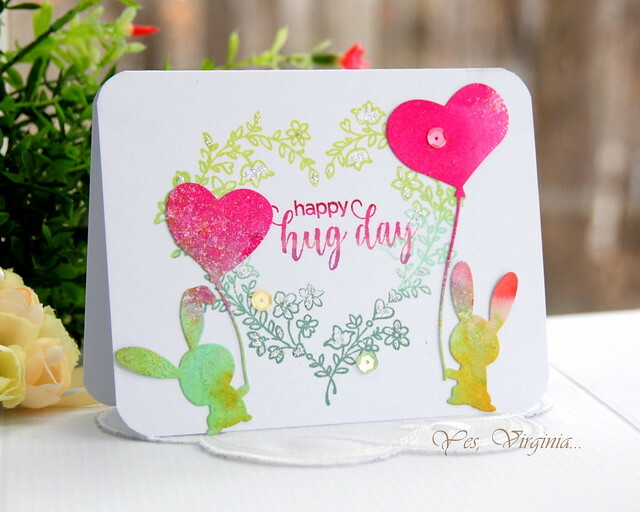 For the Sweetheart image, I stamped it in various green with the help of MISTI. This card took little time to create. It's a good thing, right? I am so pleased how this came together! If you do shop over Simon Says Stamp, you can use code "HEART" and get $5 off of your purchase. Due to last-minute schedule change, I am sharing my first DT assignment over Altenew TODAY! How very exciting! I am going to focus on "Garden Hydrangea". This stamp set is one of the new 18 stamp sets from the Jan. release and it has a matching die, too! 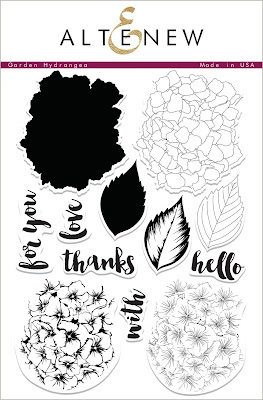 I know this stamp set is on many, many stamper's wish list. Perhaps my samples today gives you even a better idea!? 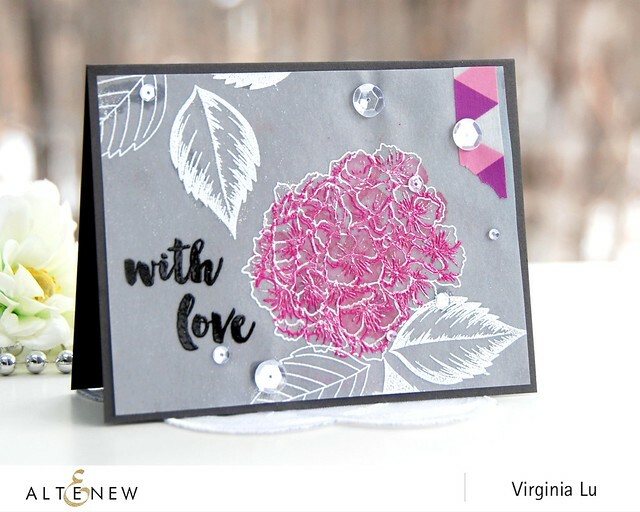 Now there are all kinds of Hydrangea stamps out there, but this one…this one has 4 layers! 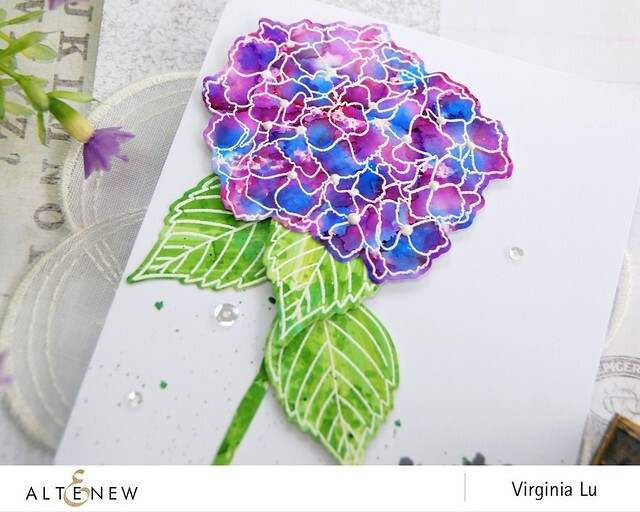 What I love about this set is that you can use ANY layer of hydrangea and use your own favorite medium. Be it a Clean and Simple style or Shabby Vintage, it’s your call. Let’s get started! My first project “with love” is all about embossing. 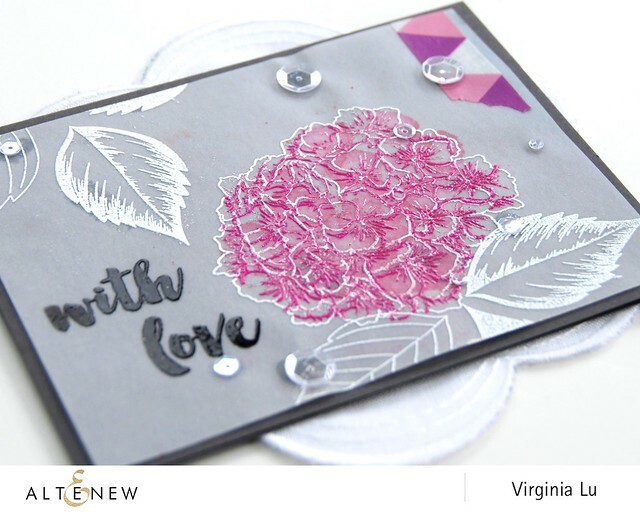 I actually embossed 2 layers of hydrangea stamps separately in pink on a piece of medium -heavy vellum. For the sentiment, I stamped Jet Black, poured clear-embossing powder over it and heat-embossed it. 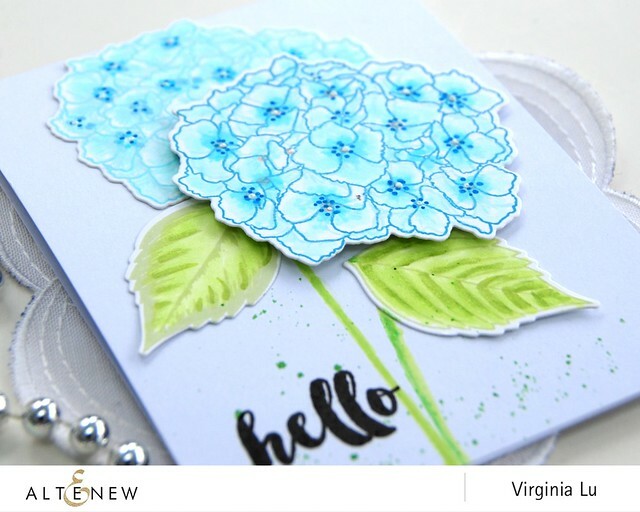 The details from Garden Hydrangea from the embossing are amazing on vellum!! For my 2nd project, I had a blast trying out the new Atenew Artist Markers (set A). Both Altenew Inks and Marker are matched perfectly. 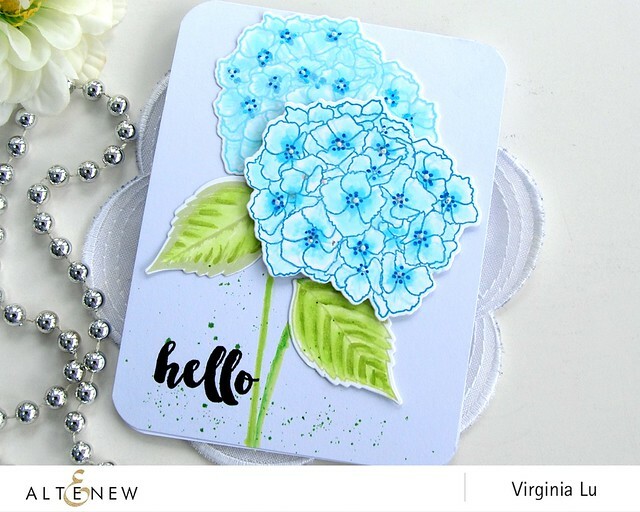 I simply had to stamp the outline hydrangea and then colored them with just with 2-3 shade of blue. I love the bullet side of the markers and added dotty details in the center for interest. The hydrangea really makes the layering easy and oh. so. polished. My 3rd project is actually the easiest of the 3 projects. I used one of my favorite mediums-Alcohol Inks. First I dabbed the inks onto a piece of Yupo/alcohol ink paper to create my own color palette. For the sentiment, I inked up the new grey ink. I love the subtle sentiment against the bright hydrangea. 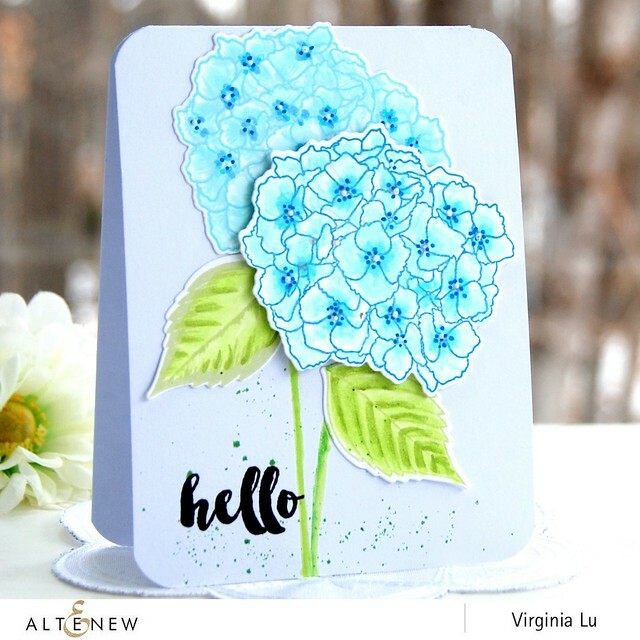 I hope my 3 projects inspire you to try out new techniques and have fun with "Garden Hydrangea". Reminder: every month, the amazing Altenew offers one of my readers/followers a chance to win $15 Gift Voucher to their online store. So, please feel free to comment on all of my Altenew posts throughout the month (including this one and Altenew's), you just might be the lucky winner! I will announce the winner on Feb.28 (last day of the month).